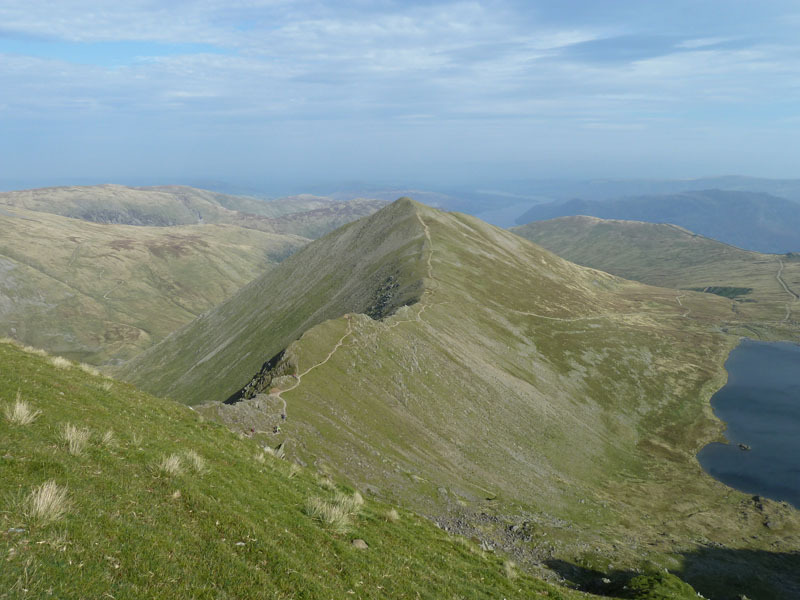 "Helvellyn and Fairfield" - no, done that. 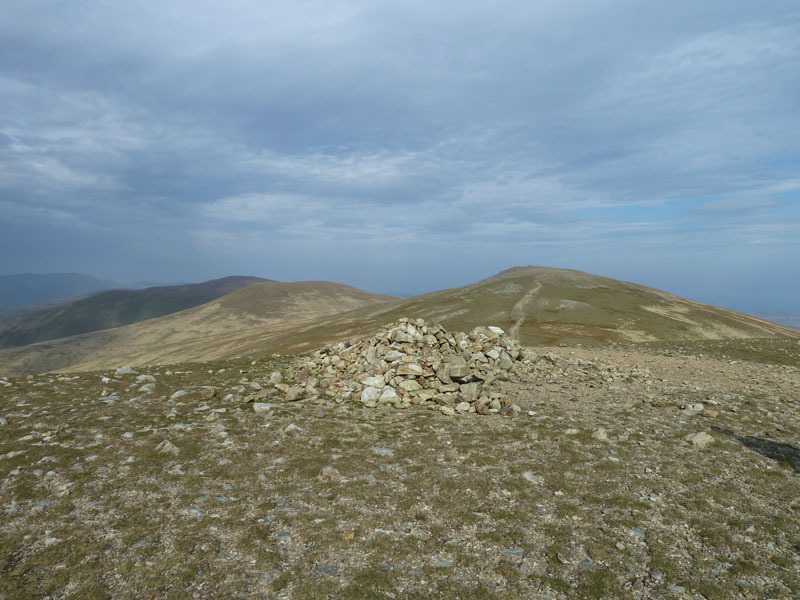 "High Hartsop Dodd to Raise" - no, David used that title; so here we are with a title showing the start and finishing points for a long walk across several felltops. A strong southerly breeze gave us hazy views, but it was shorts and t-shirts for most of the day and this is a great start to the new month. 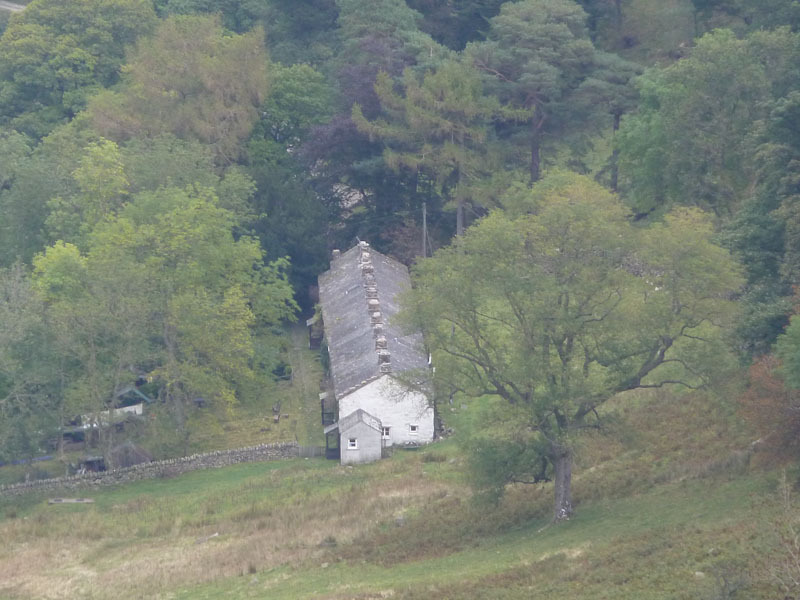 I collected David Hall from his parking spot at Stybarrow Crag and we returned to my camping spot at Sykeside. This two-car plan gave us all sorts of opportunities. 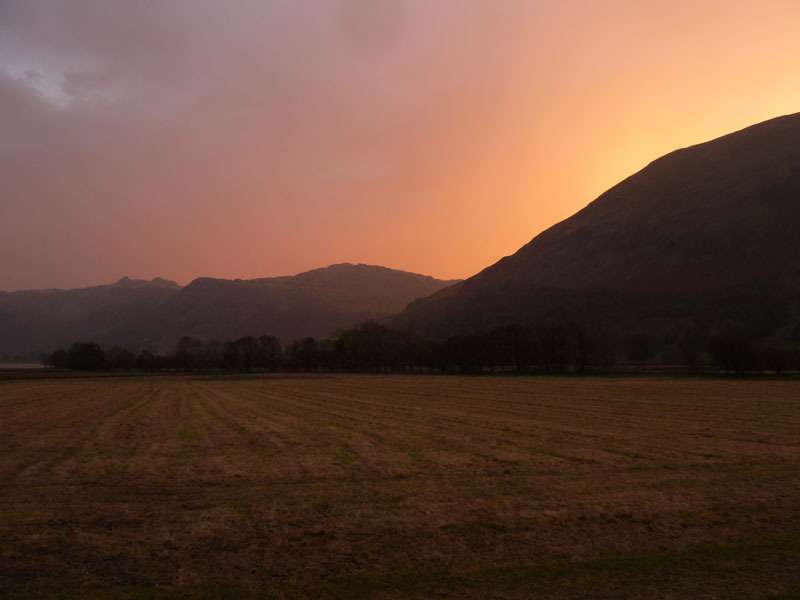 The sunrise shows the felltops of Brock Crags (centre) and Angletarn Pikes (left). 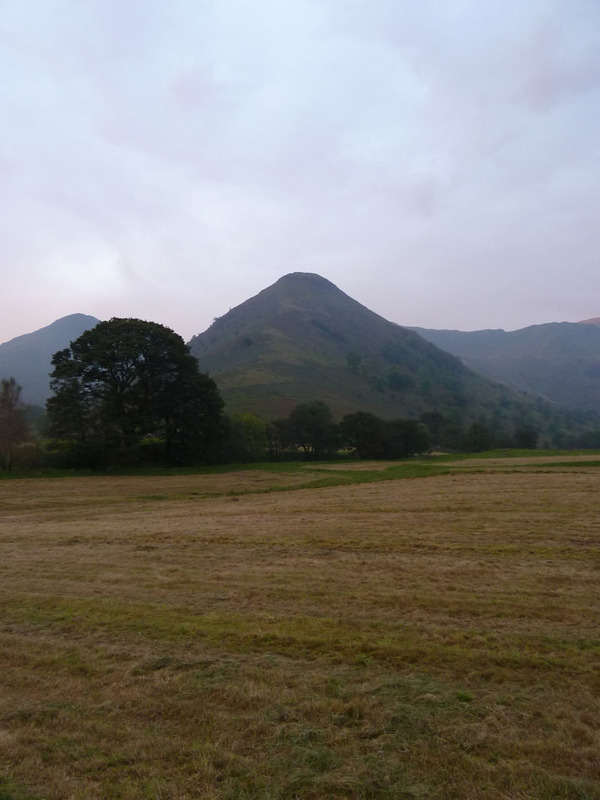 We walked past Hartsop Hall and then across freshly cut fields to the foot of High Hartsop Dodd. 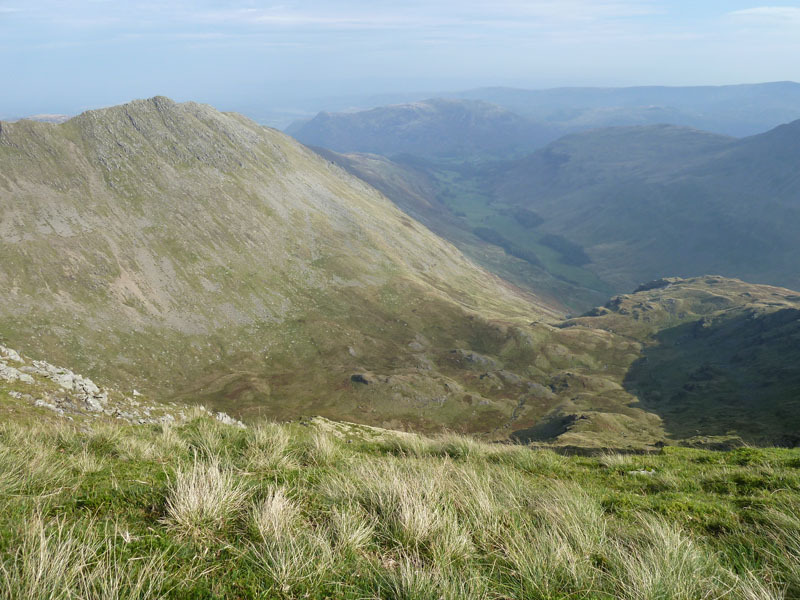 OK, hands up all you fellwalkers that have climbed High Hartsop Dodd. You've only come down haven't you? 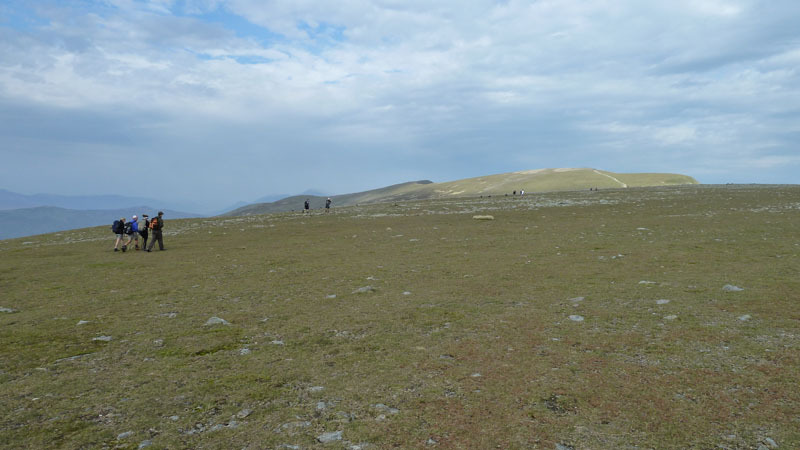 It's a "laborious" (AW) 1200ft ascent from the foot to an unremarkable summit. 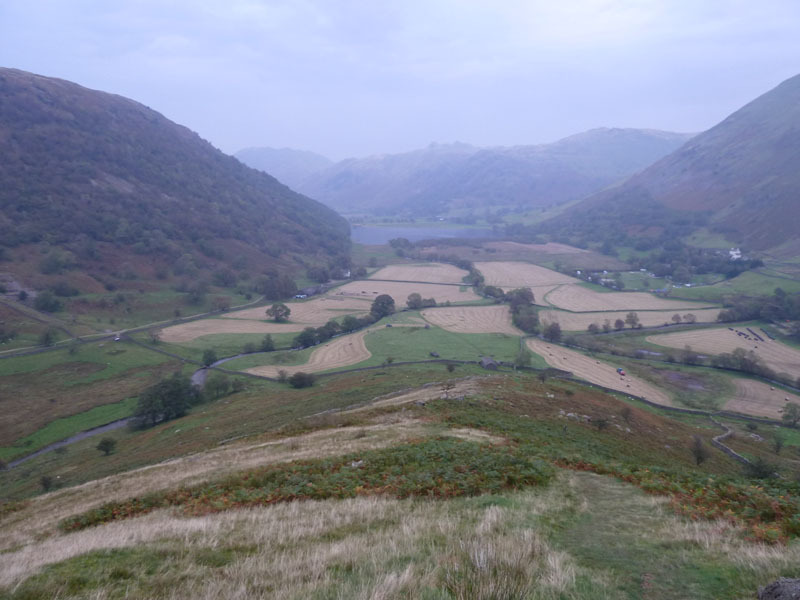 Dovedale (left) meets Kirkstone Beck (right) and form Patterdale beyond Brotherswater (centre). How Dull! 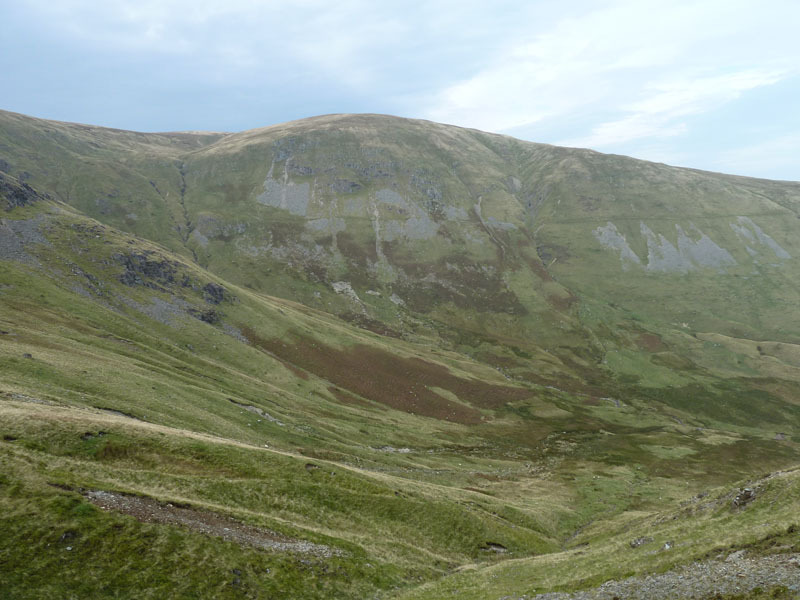 And furthermore, it isn't really the top of anything very much, walkers are immediately on the rise again, heading for Little Hart Crag, a little further south. You and I are going to have to wait for a brighter day for better photos of this area. Last time I was here, I didn't take any photos at all, so it's not one I can say too much about. 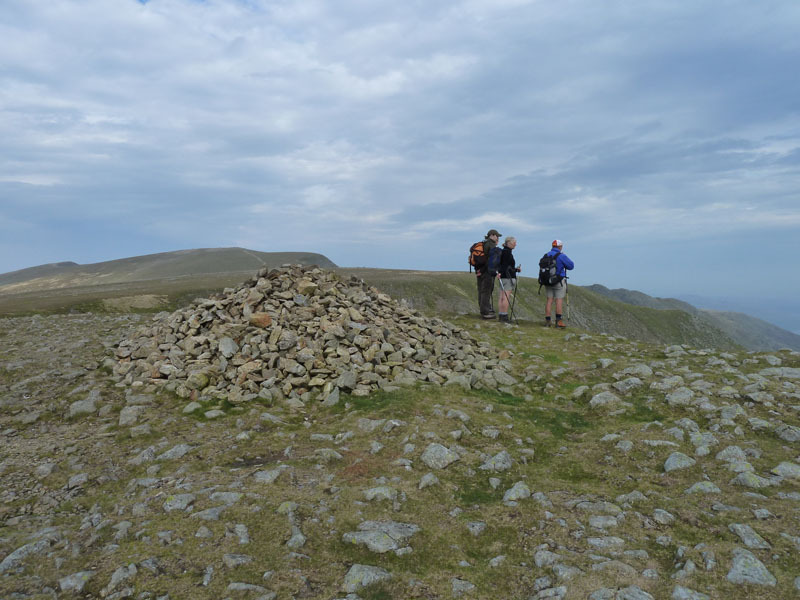 It has two high points and the westerly one is the top. 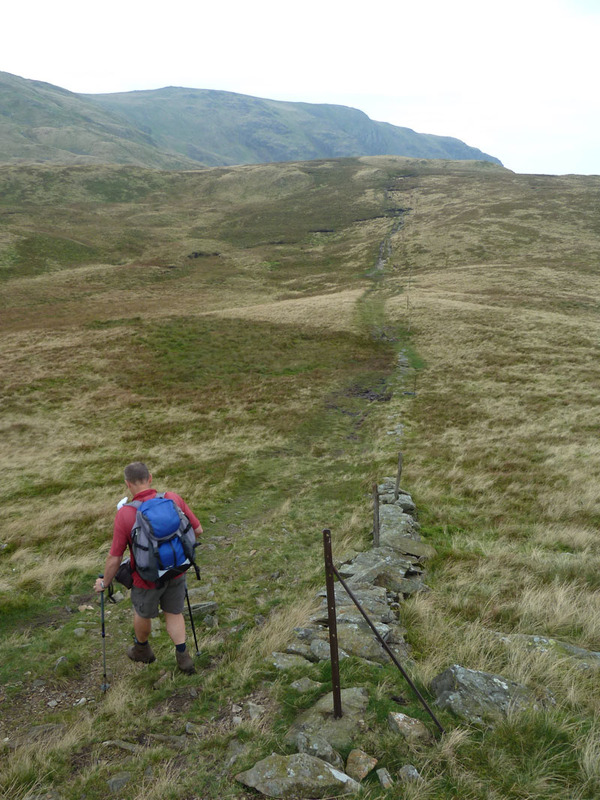 Following the wall along Black Brow and then left takes walkers to the long wall of the Fairfield Horseshoe - the one that goes nearly all the way down to Ambleside; we follow it up to the summit of Dove Crag. 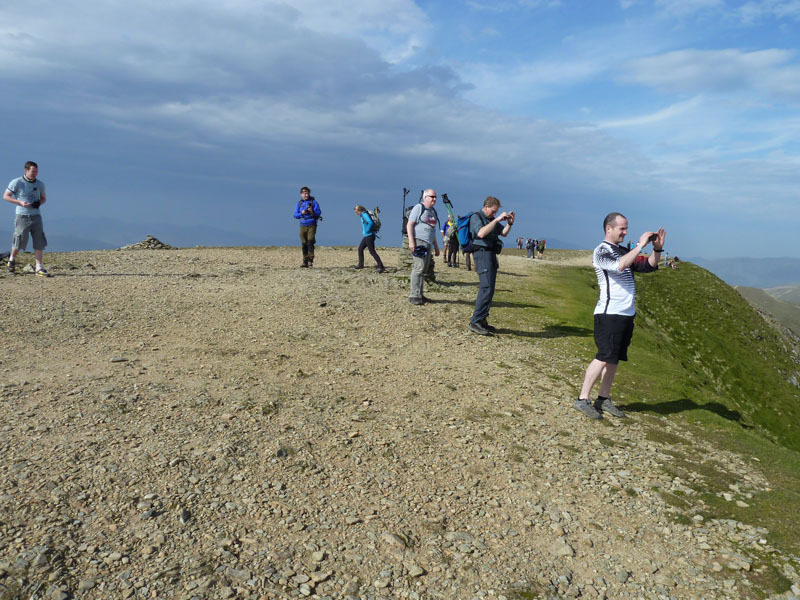 All the action on Dove Crag is on the eastern side, behind the camera and out of sight. 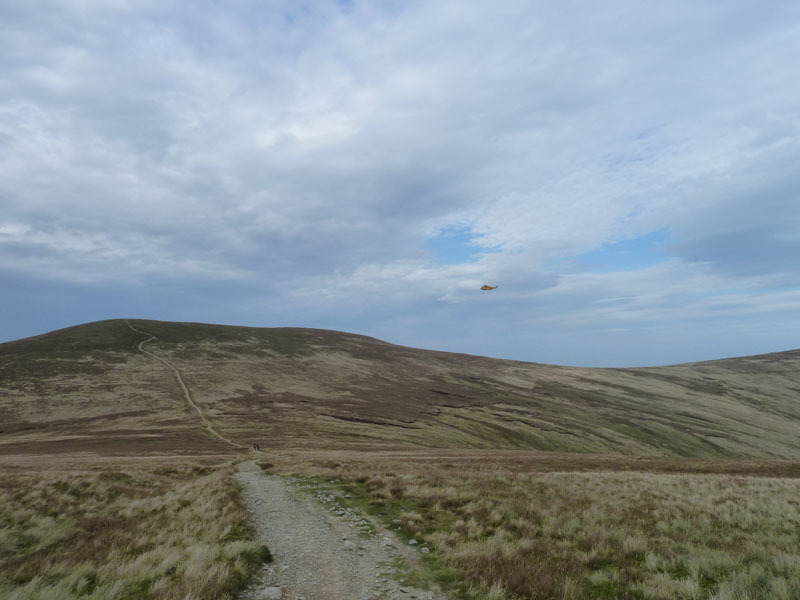 A runner is on the horseshoe route. My second visit to this top this year; the earler one was way back in March. Fairfield is just a short distance away. There are hints of brightness as the pesky local weather front is nudged westwards. 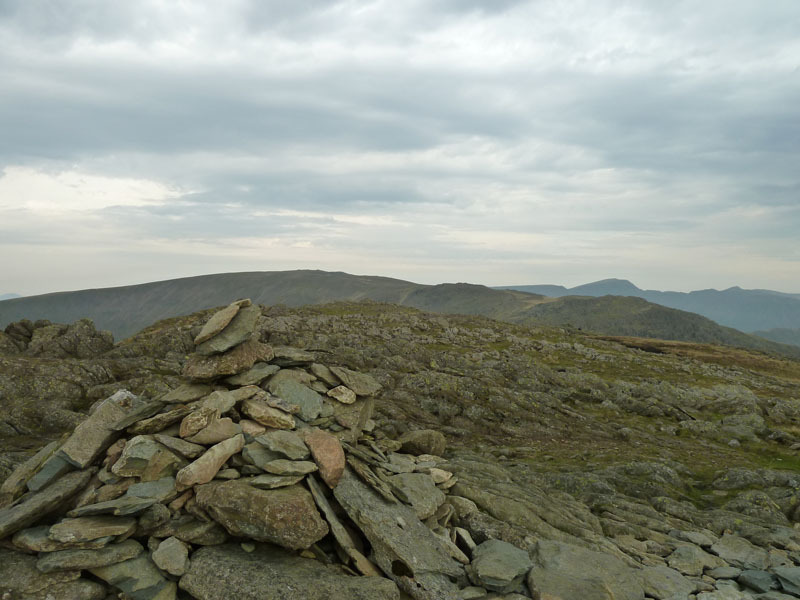 We found it quite amusing to learn that other walking friends of ours had yet to start their walk from Aira Force car park in the direction of Gowbarrow Fell and here we are on top of Fairfield, more than three hours into our adventure. No names! 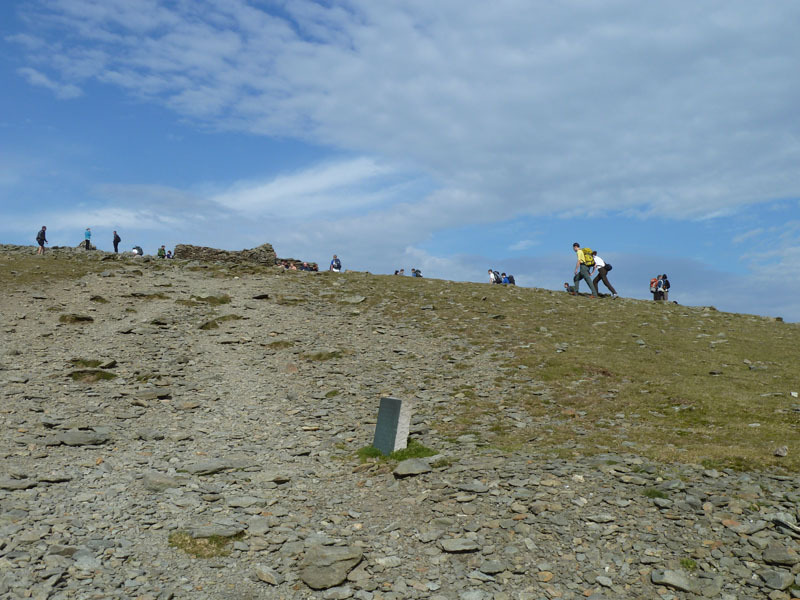 If you watch other walkers' websites it's highly likely you'll find out who they were. 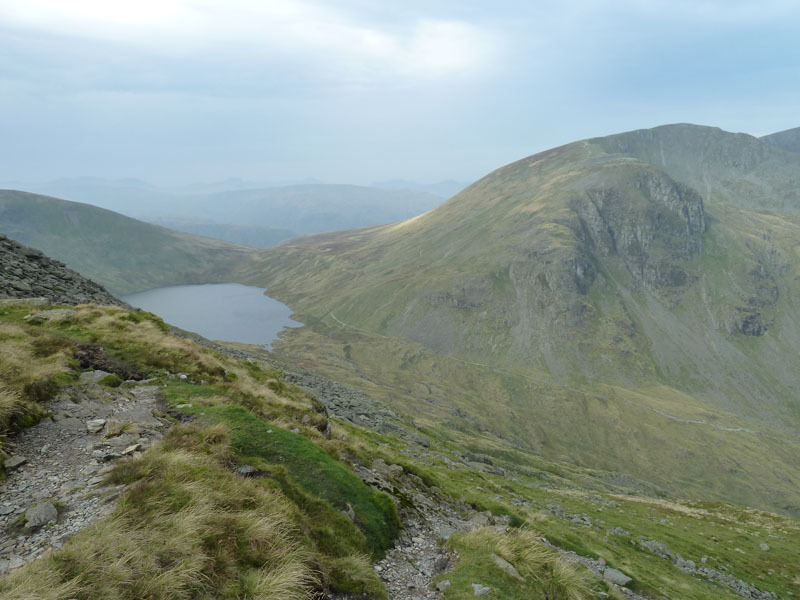 We decided to make our way down to Grisedale Tarn, over Cofa Pike and down a path to the tarn. 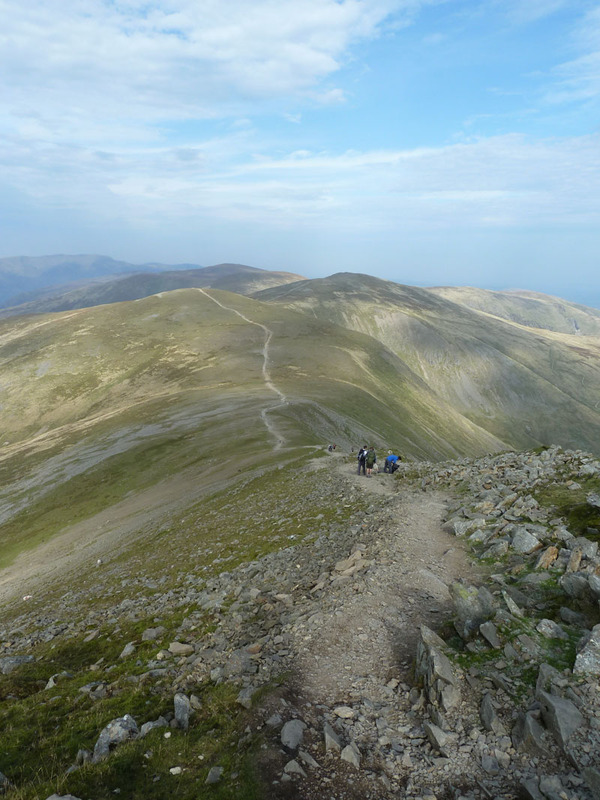 The steep direct descent off Fairfield's western is not one of my favourite routes, I tend not to stay upright on that one. 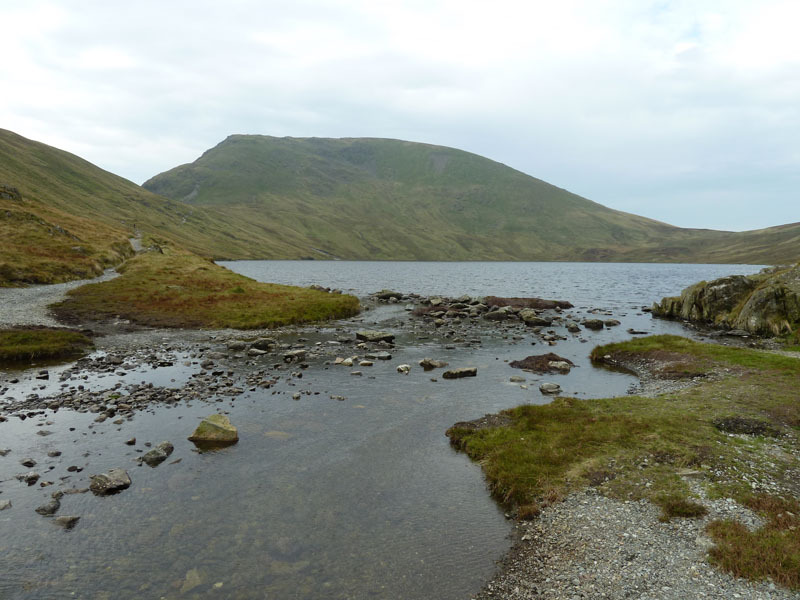 Dollywaggon Pike is to the right of the tarn. The whole area seems rather quiet; carpe deim? carpe post meridian, more likely. 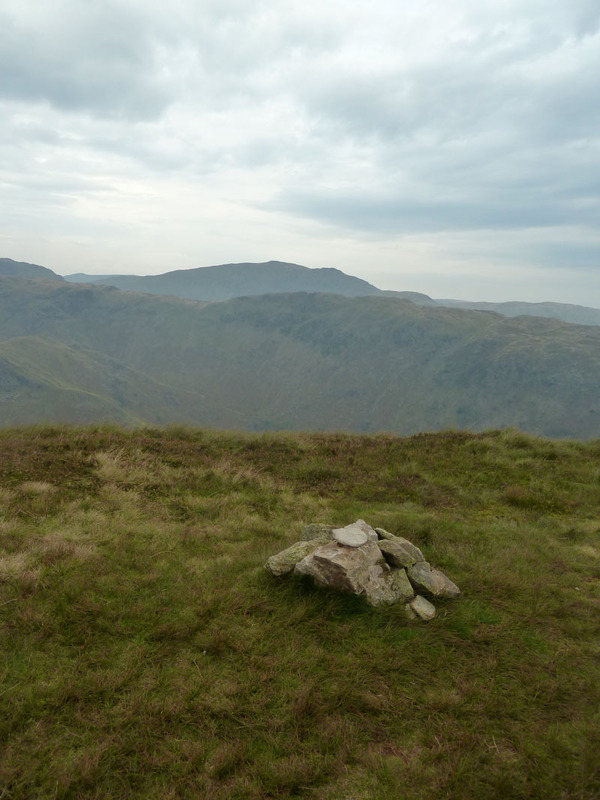 Seat Sandal is beyond the tarn. 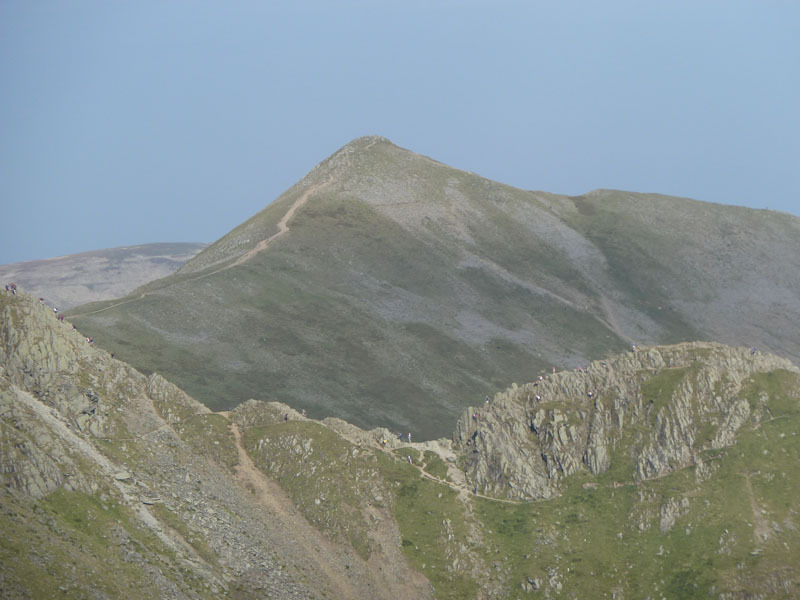 Next up is the 900ft ascent of Dollywaggon Pike. 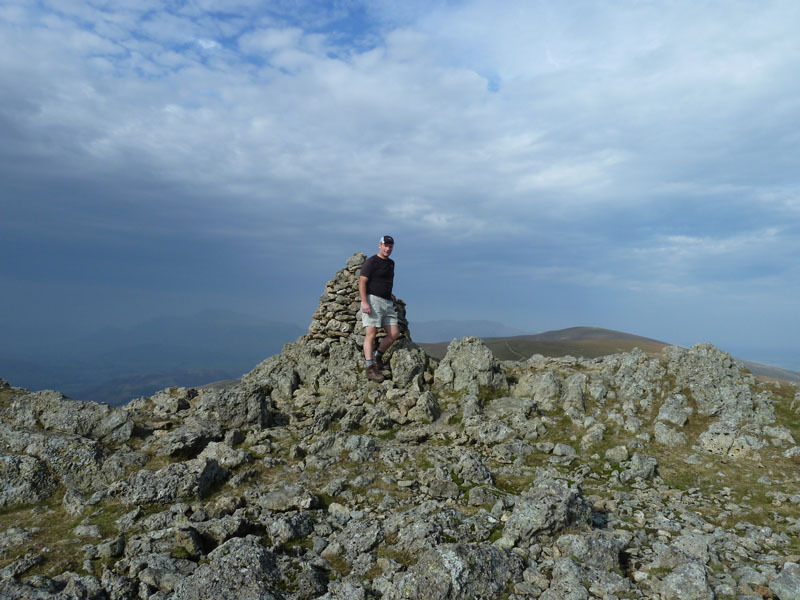 This is the link between Fairfield and Helvellyn and I've combined both fine fells on three previous occasions, these are great fellwalks with many options for start and finish points. 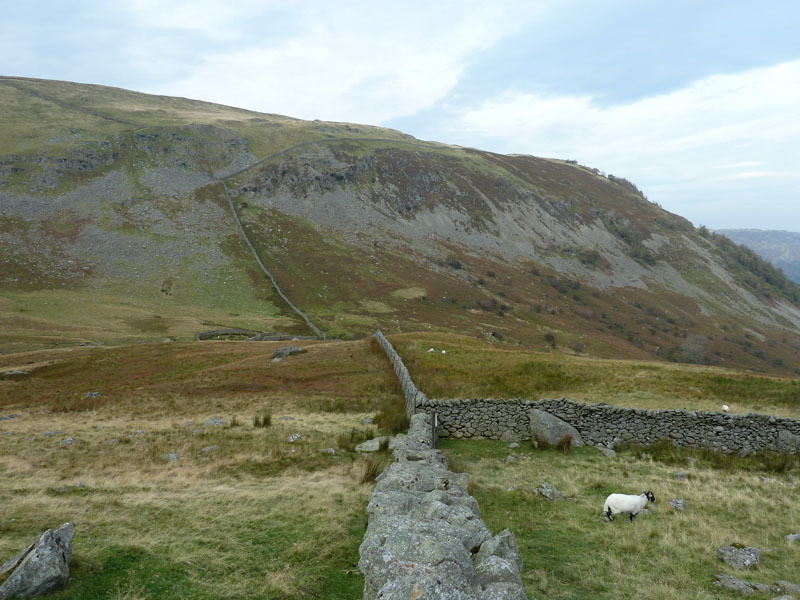 Yesterday I was on Place Fell, straight ahead down Deepdale. We have a feeling that it's going to be busy up there today. 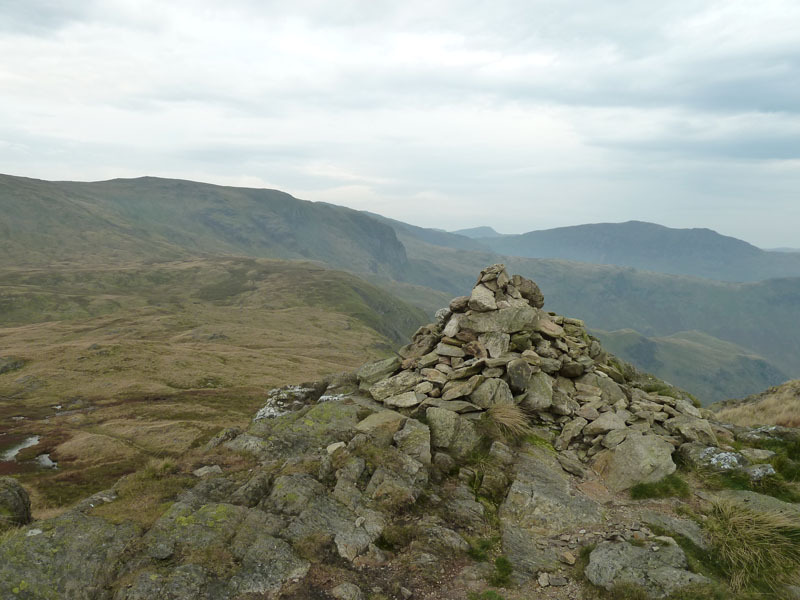 I've yet to climb Nethermost Pike, just wandering past as I've done so often, is not quite good enough. 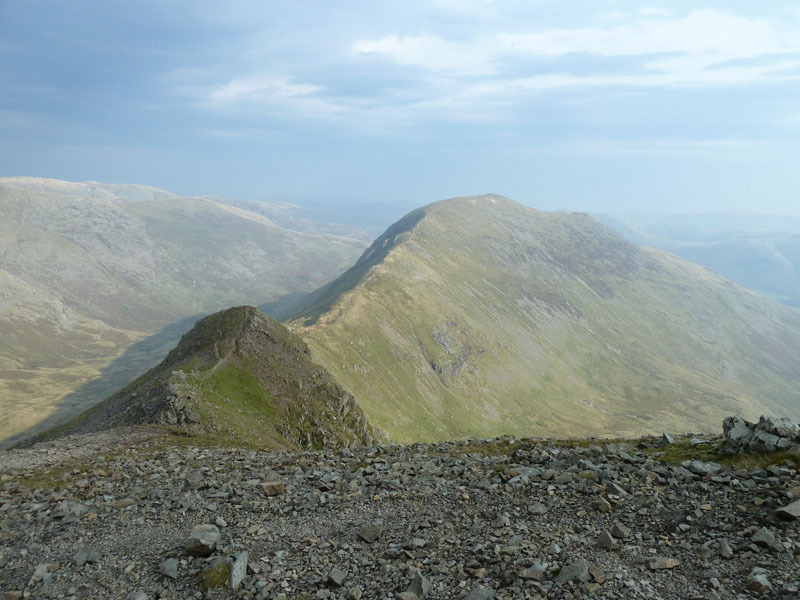 Catstycam looms large over Striding Edge. 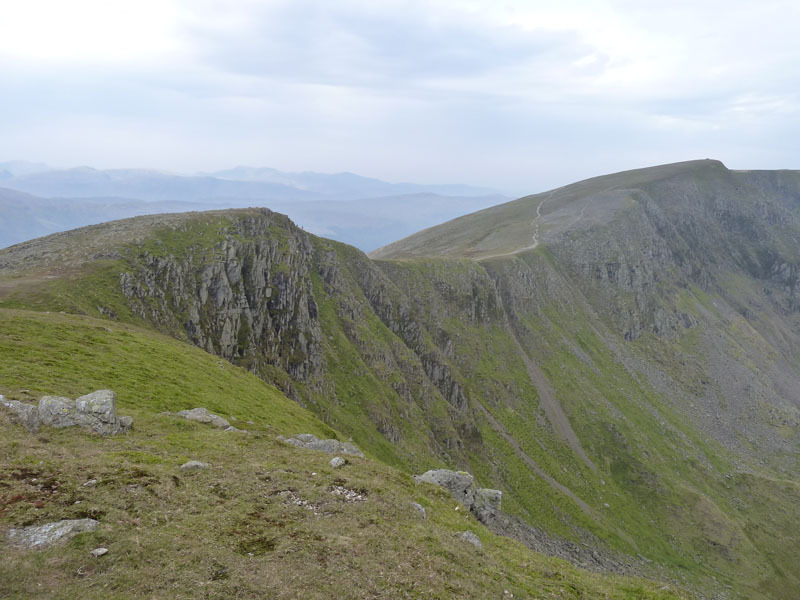 One day, I think I'll stand at the start of the Edge, wearing important looking clothing, and charge everyone a fiver for access to the route. And then scarper before I'm rumbled! Recently there has been news of some clown driving a "4x4" to the top of Snowdon - see news item, if you like (new window). So where does that leave the pilot who landed his aeroplane on here way back in 1926? 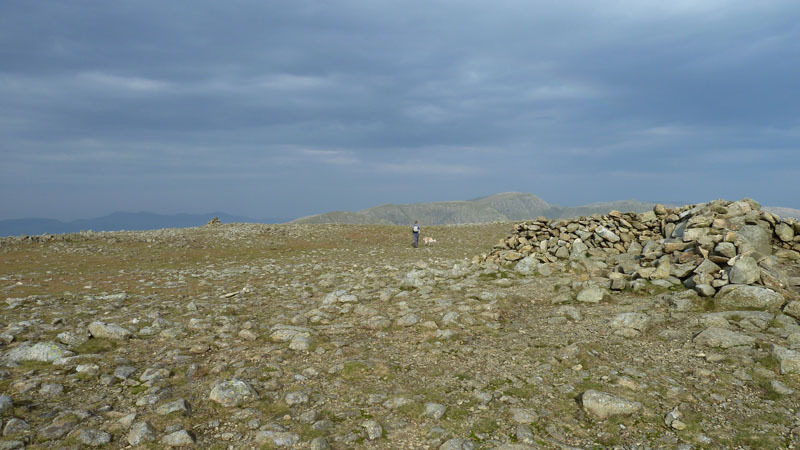 Most folk pass or rest in the shelter, maybe then visiting the trig and beyond. How many come and stand where I'm stood, on the top of the mountain? 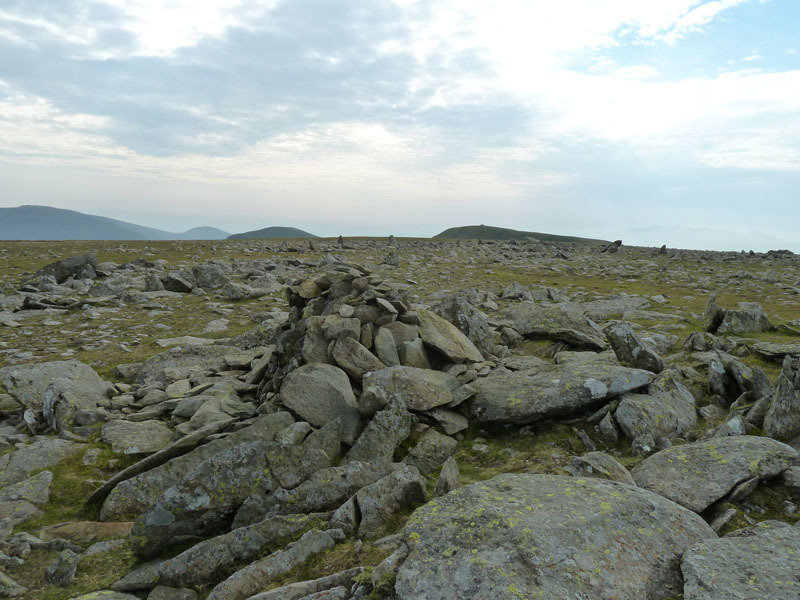 We'd already had lunch, back on Nethermost Pike, so we don't need to hang around. I don't know what's going on. Folk don't seem to be able to walk a few paces without taking a photo, not really my thing. 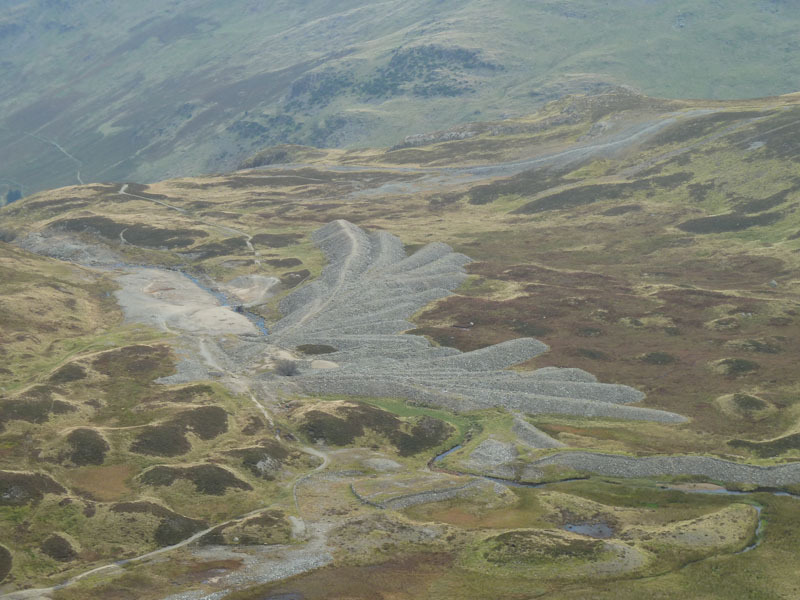 Our route along the Eastern ridge went as far as Sticks Pass and then we picked a contour to head for the old mines and quarries on the slopes of White Stones, part of the disused Greenside Mining operations. 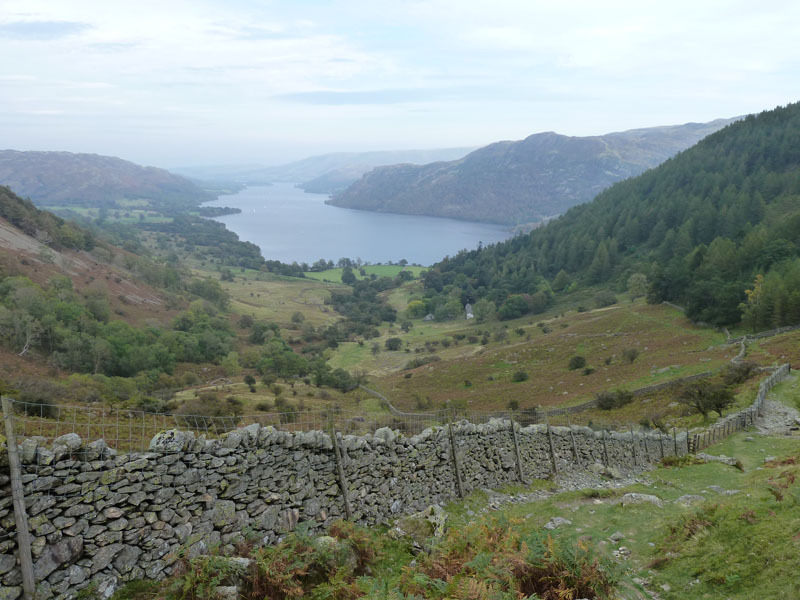 We followed a good path down Glencoyne and past the cottages of Seldom Seen to find the roadside and soon enough we were at Stybarrow Crag, where David's car was parked. Walkers: David Hall and me. 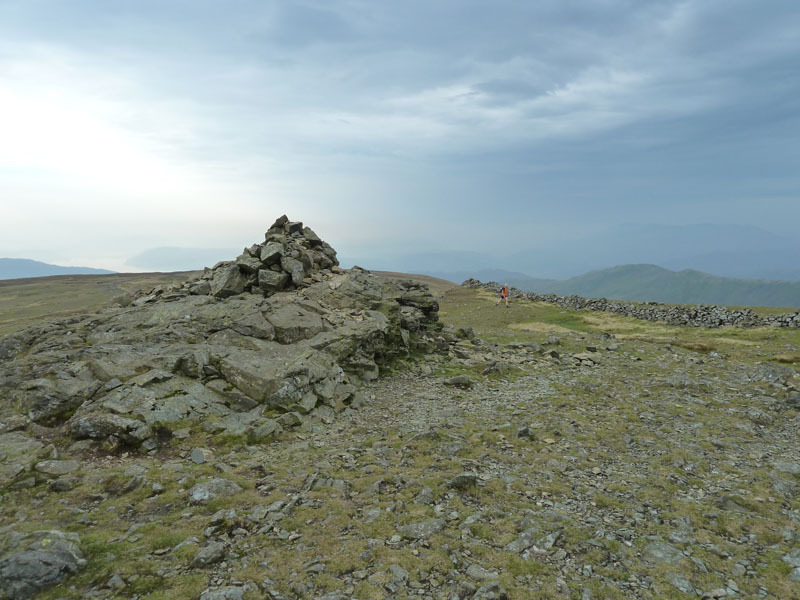 Time taken: 8hrs 50mins over a distance of 14 miles; 5,300ft of ascent. 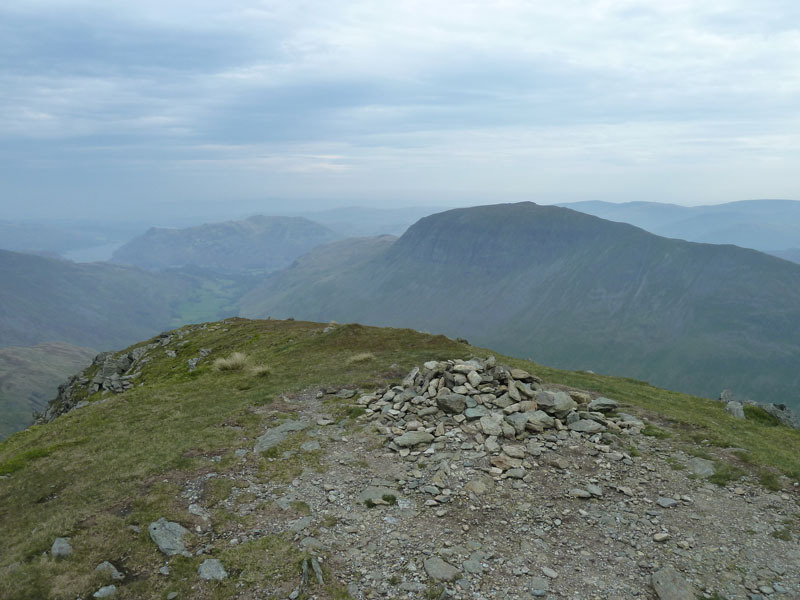 Route: Sykeside campsite, High Hartsop Dodd, Little Hart Crag, Black Brow, Dove Crag, Hart Crag, Fairfield, Cofa Pike, Grisedale Tarn, Dollywaggon Pike, High Crag, Nethermost Pike, Helvellyn, Lower Man, White Side, Raise, Sticks Pass, Glencoyne, Seldom Seen, Ullswater and Stybarrow Crag. 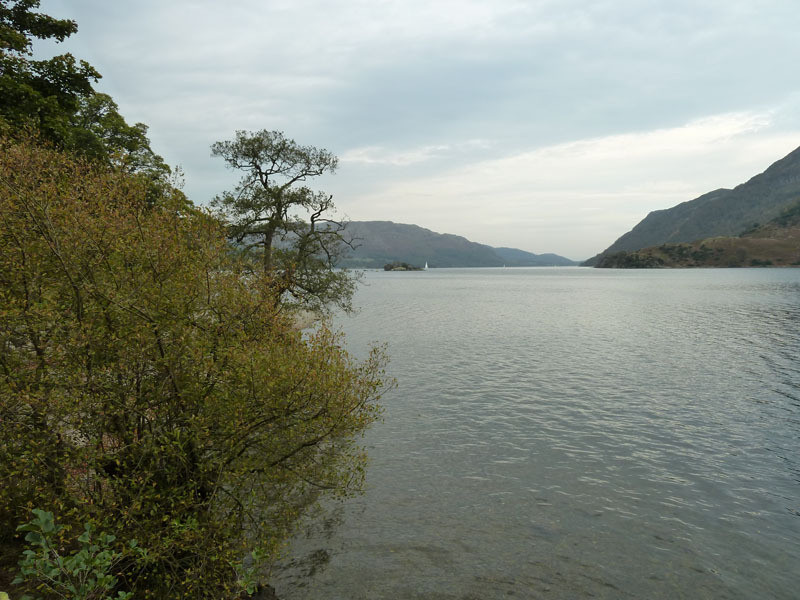 Weather and conditions: Dull and hazy, easing to bright spells and weak sunshine, always warm. 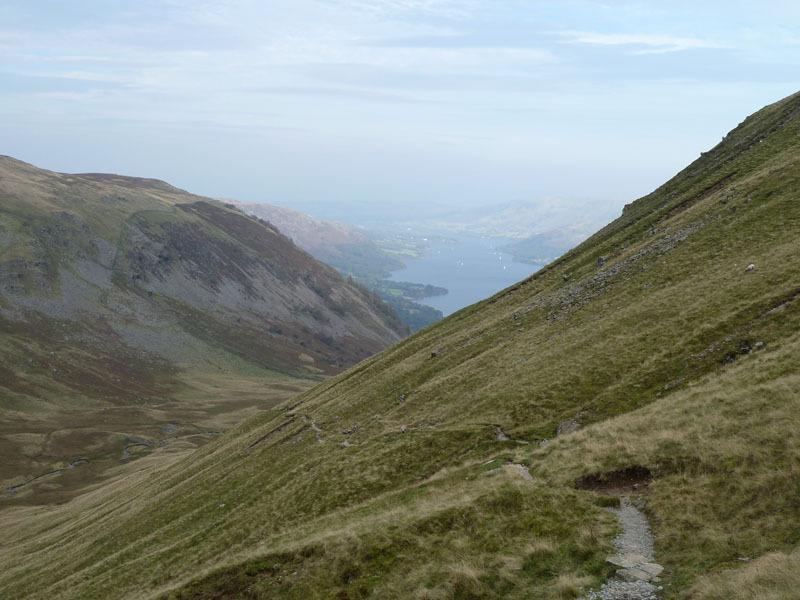 Greetings Count: Our first "hello" was a chap heading down off Dove Crag, after that it was a popular day on the fells. 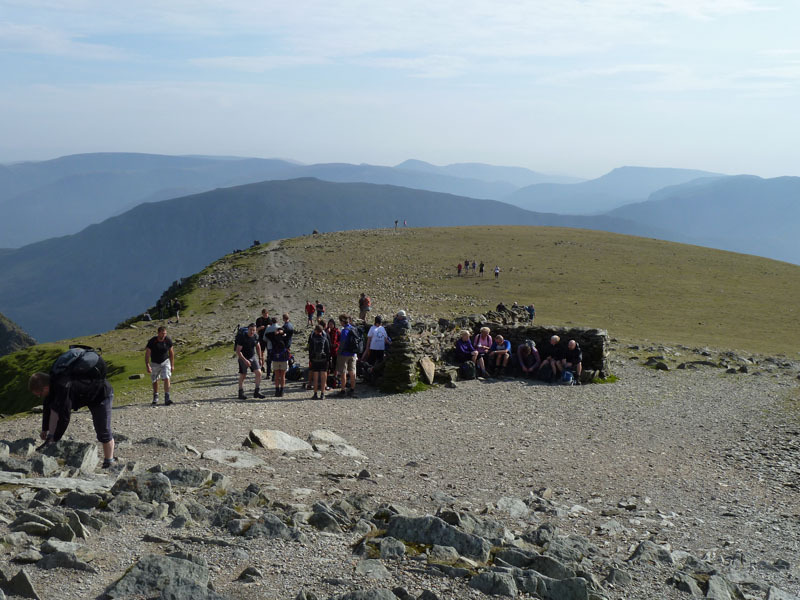 Helvellyn is a very popular destination and we only encountered the crowds at the top, as our route is not one for the tourists. Richard's Refreshment Review: Nothing to report on this occasion.